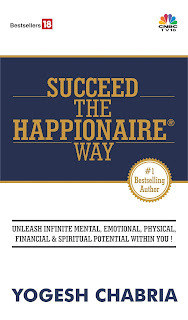 Yogesh Chabria - The Happionaire ​Blog - Best Motivational Speakers In India - Inspiration, Success: When Will It Happen? Let us say you go to your car mechanic and he tells you that the wire connecting your brakes and car is lose. What will you do? Will you ask him for the exact time at which the brakes will fail or will you immediately request him to repair the problem? It is quite possible, that your brakes might work for sometime till the wire completely breaks off. Will you take the risk of repairing the brakes moments before they actually fail? The same way when it comes to investing, it is possible to know when things are overvalued or undervalued, but no body can predict the exact time when a crash or a rally will come. We need to learn to leave a bit on the table and pull out when we are in heavy profits and need to invest when the markets are in deep red. A lot of people have been asking – when will a property crash and stock market correction come? Others have been asking if it still makes sense to buy gold. I am sitting largely on cash and continue to hold gold. That is all I can say at the moment, because a lot has already been said by me in the past. Time will make things clearer on the real reasons gold is bound to rise. We will be entering one of history’s most exciting as well as challenging moments soon. Unfortunately, people who are not prepared will end up losing large amounts of money and a very small minority who is armed with knowledge will end up being rewarded enormously. Investors in major Mutual Funds, Insurance, Real Estate as well as some big International Banks will bear major losses across the world. India will be relatively protected, but there have been lots of instances where financial institutions have sold junk Mutual Funds and Investments to clients. In spite of India offering so many value picks, these people prefer to chase a handful of glamorous companies in businesses that are losing cash daily. Look at some of the media companies in India and see the amounts of cash they are burning. People on the inside already know what is coming and most of the large media organizations and rating agencies are well funded by people on the inside to let the masses know the realities. Isn’t it surprising that America has a better credit rating than India, even though it is head deep in debt? What happened in Dubai is very small, as mentioned earlier. We all knew it was coming. Imagine what happens when the great grandfathers of Dubai in terms of debt go under. On another point the recent eagerness to change timings of the stock exchanges, doesn’t really matter to investors. A good investment is always a good investment and a bad investment is always a bad investment. It doesn’t matter whether it is 9 am or 10 am. Of course, I can understand that is must be hard for people working at brokerage houses to leave much earlier and put in extra hours unnecessarily. I would rather want them to spend it with their family and lead a happy quality life. Recently I saw Rocket Singh – Salesman of The Year. I loved the movie and connected with Mr. Singh’s character. It reminded me of the time when I was barely 15 or 16 and during the summer vacations started working for a small company in sales. My other all time favorite continues to be Guru. Our last post had me laughing out loudly after reading the comments posted by a fellow Happionaire, whose wife is extremely upset with me. I do hope I get millions of more wives out there just as upset! Have fun and happy investing! Thanks for once again helping us not panic and guide us. What I understand from the fellow happionire(not happionire) comments asking for when will the crash happen.. is that either they are greedy or they do not have patiance.... Unfortunately wealth creation is not favoring such mentalities..... So do as everyone feels.... it is your money, your chance.. your risk.... Coz it never makes sense (as you said in this post) to say that market will fall tomorrow and if you invest tomorrow you can make huge profit by next month.... Keep the senses open.... be logical... dont be greedy.... have patience... these can help us/you. WHich is the media company (Wasting money.. )that you are referring to? Guys who celebrate their 10th anniversary or some one else? Or is it a general statement on Indian media? Within the next 12 months, the U.S. Treasury will have to refinance $2 trillion in short-term debt and about $1.5 trillion additional deficit. The US treasury will have to borrow about $3.5 trillion in only one year. That's like 30% of their GDP. Their reserves in form of currency and commodities like oil, gold etc. comprises of only 300 Billion USD. This means that US's creditors will be averse to their treasury bills and hence the dollar can further depreciate and allow the creditors to move to other avenues like Gold. Some thing our RBI has realised recently and which you have been ouspoken about for months now. Naresh Pisharody commented on US - "Their reserves in form of currency and commodities like oil, gold etc. comprises of only 300 Billion USD. ". I want to add onto it. Yesterday they have shown interest to give 100 Billion $ to support Climate Change. Either the 300 B.USD figure is incorrect or the US has lost its mental (fiscal) balance. But Yogeshbhai, whatever you are writing in your blogs so far appeals me and makes sense. However, what I fear is that if US will go down, how India's economy will be unaffected. I fear that IT and ITES in India will be finished if US will collapse. Please Please comment on this. I myself have been working in a Stock Broking Industry for past several years and I surely know how demanding this industry is. Things are not as easy as they look like from outside and now with the increase in trading hours life will only get more tough ... given the fact about the Infrastructure bottleneck in Mumbai city (especially Public transport) it will be a lot frustrating. I really feel sorry for those guys who stay in deep suburbs in mumbai and have their workplace located in TOWN. Sebi says that they want to align Indian markets with international markets, now dont we all know that NSE wants to tapp in on the SGX Nifty voulme. @Bride - Brother Good Question - this is what i have also been asking for sometime ...also its not just IT alone in India that is dependent on US : IT-BPO, Textiles, Gems & Jewellery.. and other industries that support them in india..eg. Food processing, logistics etc..
Devji - Almost all media companies are going through the same fate - except of course, a few cash rich ones. The media business will always find buyers in the forms of large business houses and corporates willing to offer support. Nareshji - Very rightly said. However, in the short term we will see a few more nations going bankrupt, as the US will try and do everything to make sure the world doesn't' move off the dollar. But in the long run, the inevitable is bound to happen. I am almost 100% invested in rupee or rupee linked assets. Bridgebhai - Climate change is just an excuse for US to shift focus from more immediate problems they face. Climate and environment can not be protected by soley giving money = it is our baic nature. Today we India's are most careful about climate, food, electricity and conscious. We don't need to be given billions for this. IT in India will survive as we ourselves as immense need for IT. Today no business can run without IT. It has become like food, clothing, water, phone, internet, finance, etc. for business. Sunilji - I can understand the difficulties. I remember how I used to travel in my early days to BSE in 2nd class of trains. More investors will come if they were to create wealth - not if timings were more or less. Samantji - Once again, I believe that good IT companies will find lots of opportunities here. Today if I have to make cars, set up a steel plant or a power plant - will I not need IT? I know media will get financial and political support in our democracy. A nation which has more English speaking youngsters than Britain will have a strong media as it grows bigger. This is my view to get into them. Also what is your views on Alternate energy companies? Apart from organised retail and domestic consumption items will they be good enough considering the orders they are getting? I dont think we should underestimate the resourcefulness and creative thinking of Americans. They will rise up again with their hardwork and intelligence. I feel that America will come out stronger from this crisin and more innovative. Dev - Not just the English media, but also Hindi and other regional languages. But just as a prudent financial investment, I am not sure how much sense it makes. If you run a political party or a large business house, the story might be different. At the moment I hold n o alternate energy company. I did in the past, but exited when I felt the hype was too much. Mohit - That has always happened and will continue to happen as markets rise. Vignesh - We shouldn't underestimate them. I agree and in the longer run they too will come out of it. They are good hard working people. But what do we do of the immediate trillions of dollars of debt due? In short, I will have to be in gold and cash atleast till a global knee reaction starts. I met a lot of informed guys who share your opinion on real estate..
Wishing you a very happy new Year 2010 Yogeshji! I believe that the Americans will innovate a lot and build a good economy which will sort out their debts. Regarding real estate, i read a report in the Hindu newspaper that the real estate companies are hoping that 2010 will be good for them!!! They are hoping that people will buy without them reducing any of their prices.Strange! I have subscribed to FAMS services and have got Nov.14 report your colleagues have prepared.